2013 we released the online shop www.erzgebirge.co.uk for German Erzgebirge christmas crafts. 2011 the russian online shop www.kukuschka.com and the chinese online shop www.guguzhong-germany.com were completed. 2009 the french online shop www.pendule-a-coucou.com and the italian online shop www.orologi-a-cucu.com were released. Since this year our shops are also certified by Trusted Shops. 2007 we created an outlet shop for the sale of exclusive Cuckoo Clocks of Adolf Herr on www.cuckoo-clock.com (german online shop: www.kuckuckuhren.de). 2004 originated the online shop www.cuckooclocks.com (german online shop: www.kuckuksuhr.net) and we started to sell 200 different original Black Forest Cuckoo Clocks worldwide. 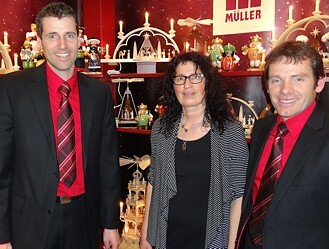 Since then, the company has focused on worldwide sales of original souvenirs and clocks from Germany. 1997 the company was founded by Diplom-Informatiker (FH) Reiner Duffner and Diplom-Informatiker (FH) Claus-Stefan Duffner. Firstly we created websites for the surrounding communities and tourist organizations. In a short time we reached 300 different hotels and hosts as customers. We also created numerous websites for companies and businesses.